PQ33, Software parametric EQ from J1000. J1000 has updated the free PQ33 equalizer effect plug-in for Windows to version 1.22. PQ33 is a freeware VST equalizer based on RND Portico 5033 hardware unit with two additional pass filters. Other than that, it has the same layout of elements, similar frequency ranges for all filters, same gain operational levels and Q factors. 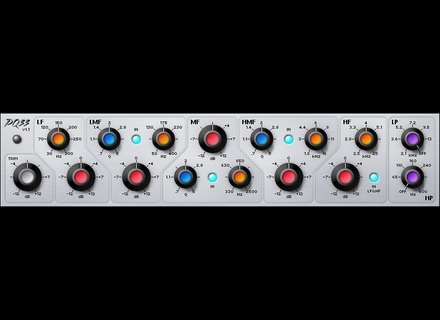 It is intended for use during mixing and tracking, but it can also be used for simple mastering tasks. More efficient peak filters resulting in overall CPU reduction of 20%. [Musikmesse] Livid Instruments OhmRGB Slim Livid Instruments announced the release of OhmRGB Slim, the lighter version of their OhmRGB controller. [Musikmesse] SeeLake AudioStation AudioStation is a Windows-based user-definable digital audio workstation. Harrison Consoles Mixbus 2.0.7 Harrison has updated Mixbus to version 2.0.7.